Hanover Engineering assisted Smithfield Township in the bidding and construction of a new sanitary sewer force main along East Brown Street within the Township and East Stroudsburg. 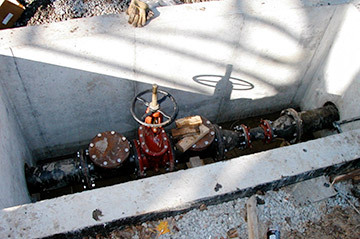 The project consisted of the installation of 2,500 linear feet of 8” high density polyethylene pipe to connect the Township’s existing sewer force main to East Stroudsburg’s existing gravity line. The project enabled a portion of the Township’s sewage flow to be redirected to East Stroudsburg’s wastewater treatment plant. The project provided 75,800 gallons per day (gpd) additional capacity in the force main, as well as provided 144,200 gpd of available capacity in the Township’s Lake Valhalla Treatment Plant, which previously had been at full capacity. The construction portion of the project was jointly funded by a PennWorks Grant and an EPA grant, with engineering costs being partially covered by the EPA grant. The original bid for the project was $1,932,400. With Hanover Engineering’s assistance, the bid documents were revised and, after rebidding the project, a bid of $953,000 was received for the same scope of work. In order to minimize costs associated with paving restoration within the existing street and shoulder, the sewer line extension was constructed using the latest horizontal directional drilling technologies. The project also included upgrades to the existing pump station, and the addition of a flow meter pit. Hanover Engineering provided full-time construction inspection and assisted with the project administration tasks, including preparation of grant payment applications, review of shop drawings, and review of payment applications.